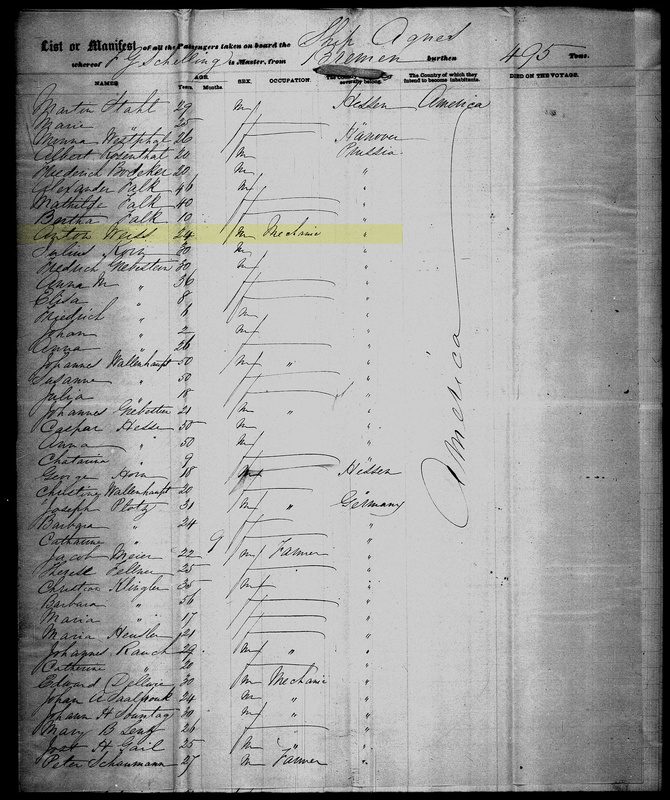 I think I’ve found the correct passenger manifest which shows my great great grandfather Anton Weiss arriving in America. Anton applied for a passport in 1886 stating that he emigrated from Bremen on 4 Mar 1852, however he forgot the ship’s name. On 9 Apr 1852 the Agnes arrived in New York from Bremen with an Anton Weiss aboard. He’s 24 years old, from Prussia, and his occupation is mechanic. That’s doesn’t exactly match what I know about Anton Weiss, but it’s reasonably close. Anton was actually 25, from Bavaria, and worked as a tinsmith in the first references to his occupation in the U.S. Anton turned 25 on 27 Feb 1852. He could easily have been 24 when he first registered with the Bremen emigration bureau. What clued me in to the manifest is an entry in the United States Germans to America Index, 1850-1897 for Anton Weiss. That lists a 24 year old Bavarian named Anton Weiss, occupation coppersmith, arriving in New York on the Agnes on 9 Apr 1852. I don’t know why this database lists him as Bavarian rather than Prussian or gives his occupation as coppersmith instead of mechanic. This entry matches what I know about Anton Weiss pretty closely. Coppersmith, tinsmith, and mechanic would have been very similar occupations in the 1850s. That discrepancy doesn’t bother me. The discrepancy that bothers me is the scanned microfilm image gives his origin as Prussian. Bavaria and Prussia were were not interchangeable countries in 1852. Indeed, several other passengers have their origin listed as Hesse, Hanover, and Germany. So where the Germans to America Index gets Bavaria, I don’t know. Stuff to research! I sorta have cross-posting working again.